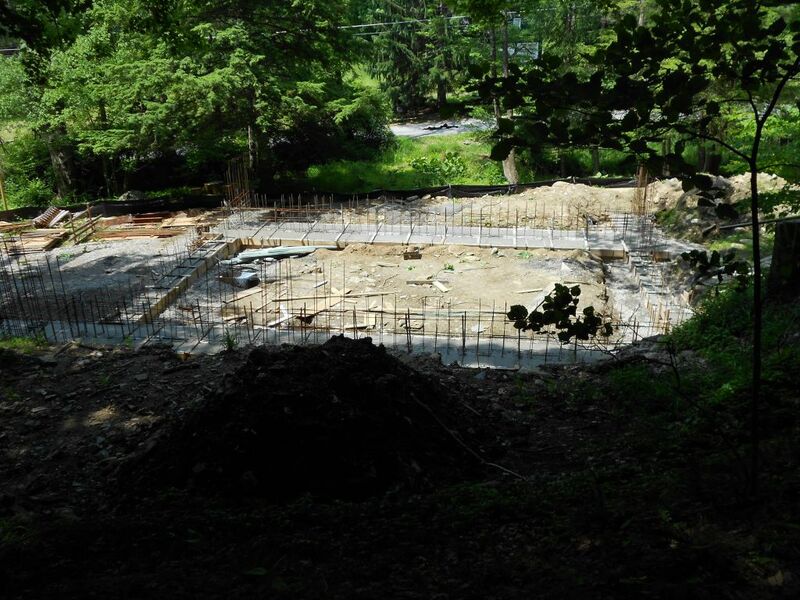 Concrete’s Here!….And all the Joys of Placing Concrete that Come with it…..Hurrrrayyyyy! I’ve been dreaming about this for years now. 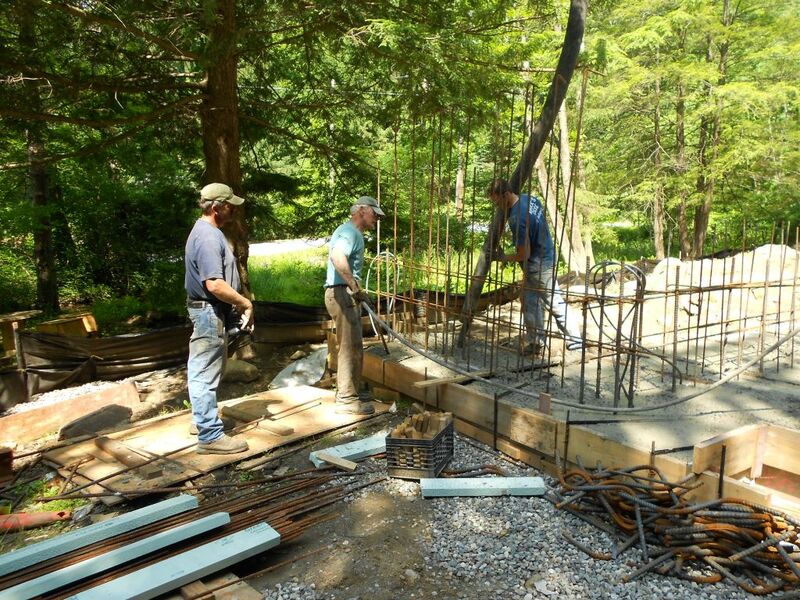 Building a real Hobbit house and a passive house to boot! I was lucky I was able to sleep last night. I woke up at 12:30 and thought that I wasn’t going to be able to go back to sleep.Thank goodness I did! I was tired from the day before.My son Terence had his 8th grade graduation and invited his whole class over to our house after graduation. I didn’t have much time. Back to the little odds and ends: Remember the scene from “The Wizard of Oz” when they got to Oz and were all getting taken care of before they saw the Wizard? Remember the song? That’s the song I sang while I did my odds and ends Friday morning. Sytrofoam here, banding while there, a couple of la dee daas. I didn’t finish all the odds and ends. I knew I still had Saturday morning so I wasn’t getting nervous. Not yet anyway. Back home. Shower. Get dressed. Over to graduation. Terence did great. Back home to get ready for the party. It’s this social media thing. We kept asking him all week how many people are coming over? I don’t really know , only Peter texted me back so far. Well that’s great. By the end of the week it kind of sounded like 30 people were going to come over. About 60 showed up.Man was are yard loaded with kids. They were good though and I think they had a good time. We had a tug of war and a balloon toss. I think they got a kick out of it. Some of his close friends stayed later and I wound up driving them home. I stopped by the Hobbit house and had Terence and his friend Peter help me pull some wire and do a little clean up for me. We were there for 15 minutes but it was actually a big help. The wire they helped me with is called poly coated BX. It’s a metallic sheathed electrical wire that has a plastic coating on it.It’s rated for direct burial and is OK to pour in concrete. It’s a pain to pull by yourself though. I’m going to install the outside GFI outlets right inside the concrete walls so I needed to set that up before the pour. Here’s what it looks like. Poly coated BX for exterior outlets. Saturday morning 4:30 AM: Well… This is the day we’ve been waiting for so let’s get started. I stop on the way to get coffee at a local deli. Finished the coffee. Started to get set up for the day. Got all the tools for the pour into the truck and started to back up to the edge of the footing. Then something happened. I want to blame the coffee but it probably was just nerves. 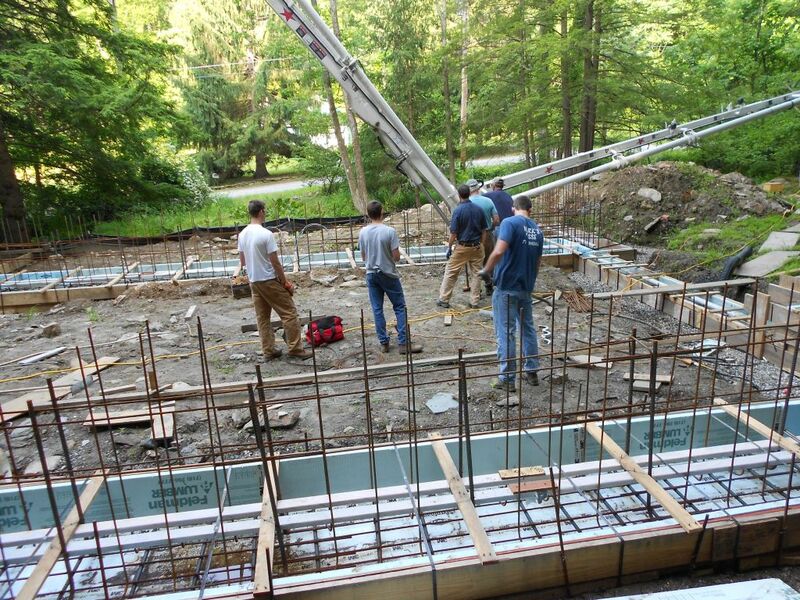 (I always get nervous when I pour concrete. You never know what is going to happen.) I have to go back home…the coffee accelerated the digestion process and I have to go. Very badly all of a sudden…..Thank the Lord there were no cops out that early. That was the fastest I have ever made it home from the Hobbit house…..I don’t know if the editor is going to let me leave this part of the day in…we’ll see. I’m ready. For all intents and purposes I’m ready. I have an old friend from work who helped me pour the Hobbit Shed named Albert Clark. He said he would come up and give me a hand for the day. I was really thankful that he said he could make it. He’s been doing concrete work for years and knows a lot about concrete pumps and finishing concrete as well…And I thought he would be good with my sons as well and he really was. Thanks Albert! Of course the pump was late getting there. He was supposed to be there at 7:30. He got there about 7:45. When I see the pump I’m saying to myself: Man, this thing looks awful big.I really wanted like a 17 meter pump or the smallest pump they had,which the guy said was a 31 meter. The price was pretty good so I said Ok. The guy shows up with a 38 meter. This thing is long and I’m thinking he’s not gonna make the turn into the lot. I close my eyes and tell Albert to get the pump in. They got it in. 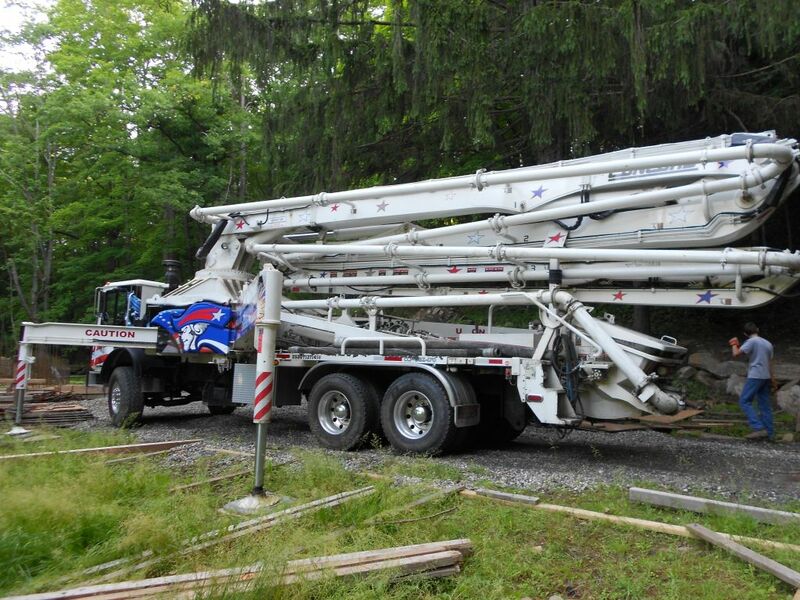 38 meter concrete pump with outriggers extended. I know ther’s a way to blot things out of pictures but I think that is a Patriots logo on the truck.Patriot fans are not allowed on my property but I had to make an exception today. But I digress. He unfolds the boom we pull in our first truck and start pumping. We thought we were going to start pumping but the line is jammed…and the concrete won’t come out of the free end of the hose. Great. Here we go. 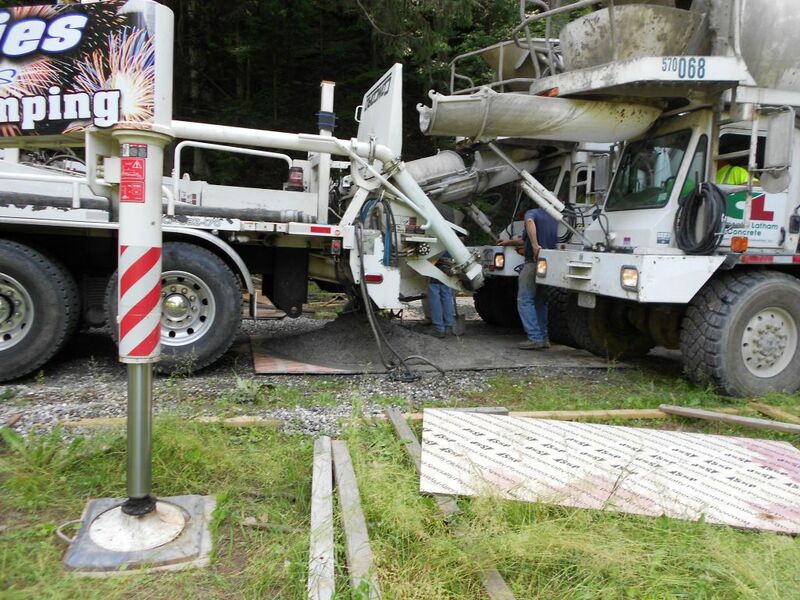 The longer the boom of the pump is the easier it is for the concrete to jamb.What happens is all the sand,cement and water that is in the mix gets pulled out of the mix as it initially goes through the pump and what you are left with is the stone which usually gets stuck at one of the elbows. We found the elbow and had to take it off. Pump is jammed. We had to take off an elbow. Once the line was clear we got started. It was going pretty well. The boys got the hang of what we were doing pretty quickly and we got into a rhythm. After the second truck finished we had to wait for the next truck so we dropped back and added rebar to the small footings for the knee wall that we will pour next. 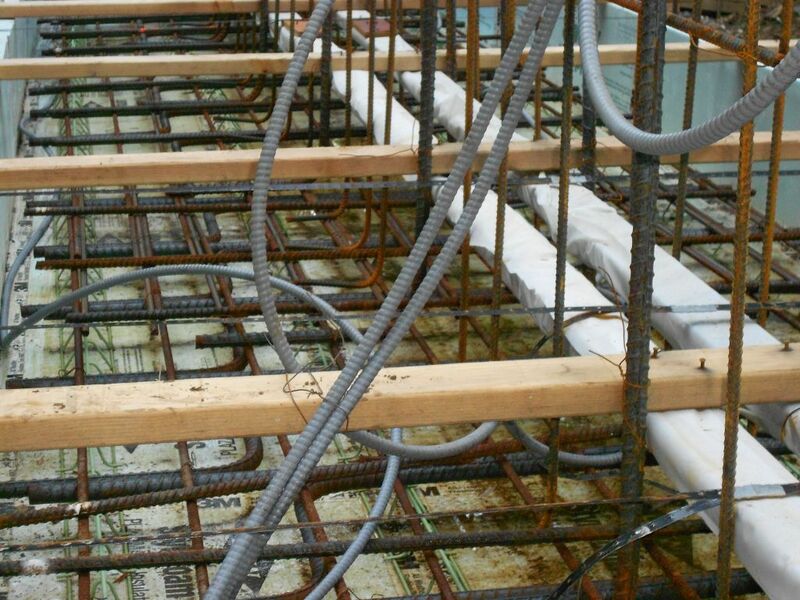 Placing rebar into the wet concrete for a small knee wall. This looks like a staring contest. The pump operator “Lee” was a good guy. He helped a bit and had a few good suggestions along the way. The third truck shows up and we get started again….then all of a sudden Lee leaves and goes over to the concrete truck….I’m like what is going on now. I go over to the truck and he tells me the concrete is not going through the line,it’s to boney. Meaning there’s to much stone and not enough cream. It looks as if the concrete has separated. I call the plant and make sure that they sent a pump mix. The dispatcher says all there mixes are for pumps. Well I guess this one decided to change its mind because this batch of concrete does not want to go through the line.Lee tries a couple of manuevers but it doesn’t work. We have to drop the concrete out of the hopper. This is going to be a long day. We put some plywood under the hopper and let it go. I then had Ethan and Jude shovel it into a wheel barrow and dump it in the footing. Here’s a picture of the concrete under the hopper. A half yard of concrete comes out of the hopper. If you noticed in this picture you’ll see two concrete trucks pulled up to the hopper. 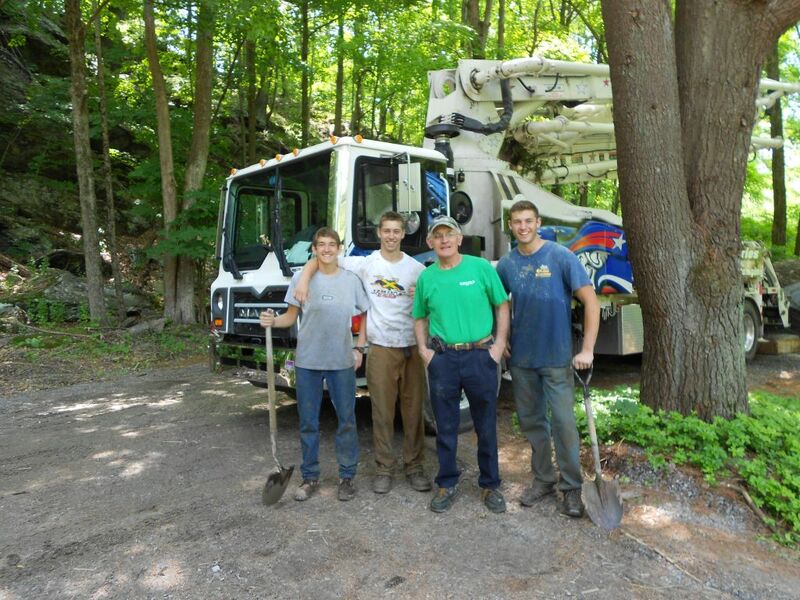 What we were able to do is mix the good truck with the boney truck and use all the concrete from the truck we couldn’t put through the pump line. The only problem we had now was that we lost Ethan and Jude to shoveling up the concrete. So Albert,Terence, and I poured about 8 feet of footing at a time. We would pump a bit vibrate and level it off and then move the hose. Ethan and Jude finished faster than I thought so it wasn’t too bad. Once the concrete started coming out okay I knew we were going to be fine. The balance of the pour went well and we now have something to work with. 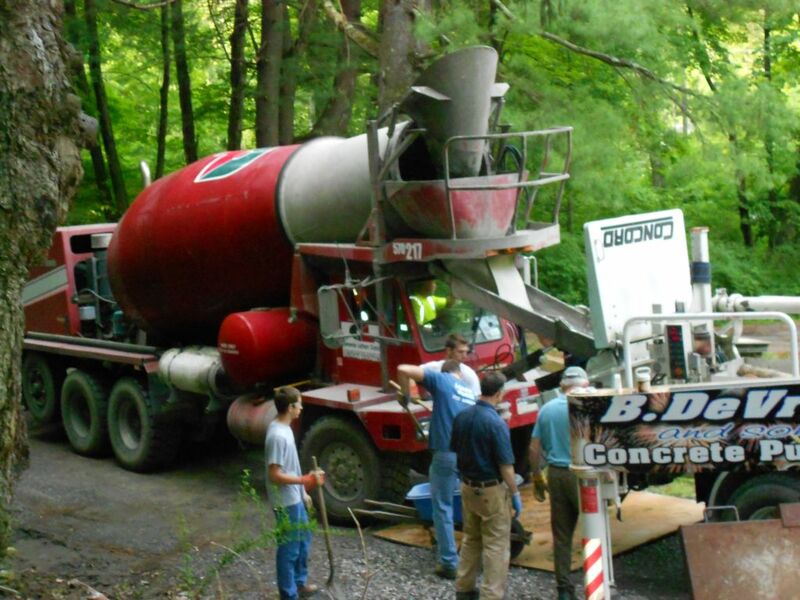 By the way it was 38 yards of concrete in 5 trucks. (3)8 yarders and(2) 7 yarders.I really didn’t want a ten yard truck going over the bridge. I think it would have been fine though.Here’s the crew. Here’s a few more pictures from the day. Jude on the hose. Lee the pump operator is on the left. First truck of the day. I recognized one of the concrete truck drivers. 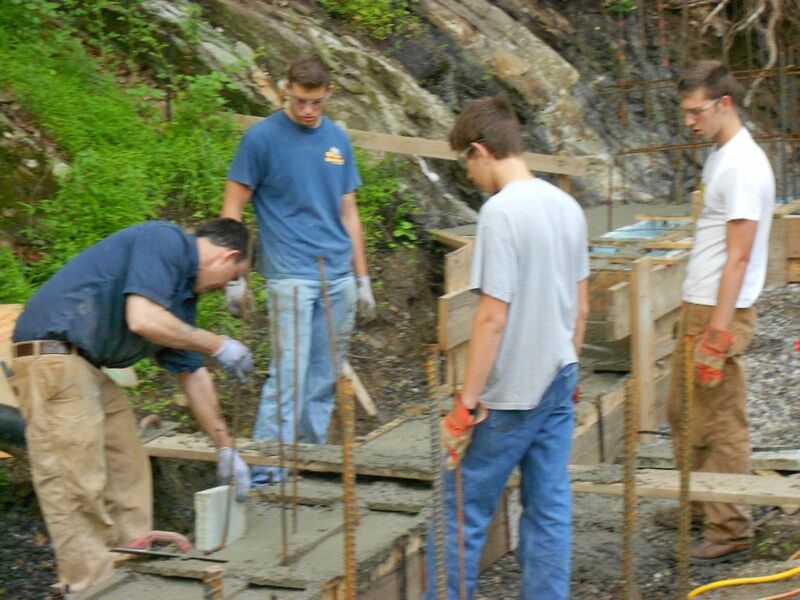 He brought concrete way back when when we poured the bridge. My wife was talking to him and he said: “I built that bridge.” That’s funny I thought I built the bridge. We started around 7:30 and finished up by 11:00. Which was’t bad considering all that had happened. And no blow outs thank God. P.S. Ethan found a frog jumping through the footings right after we dumped the first truck. He couldn’t catch him but luckily my wife was able to get him safely out before he ended up with a little set of concrete frog shoes! We figured it would be bad luck to have a frog cast in mafia block in our foundation. I’m hoping to get the forms delivered next weekend so pray for good weather and enjoy your week! 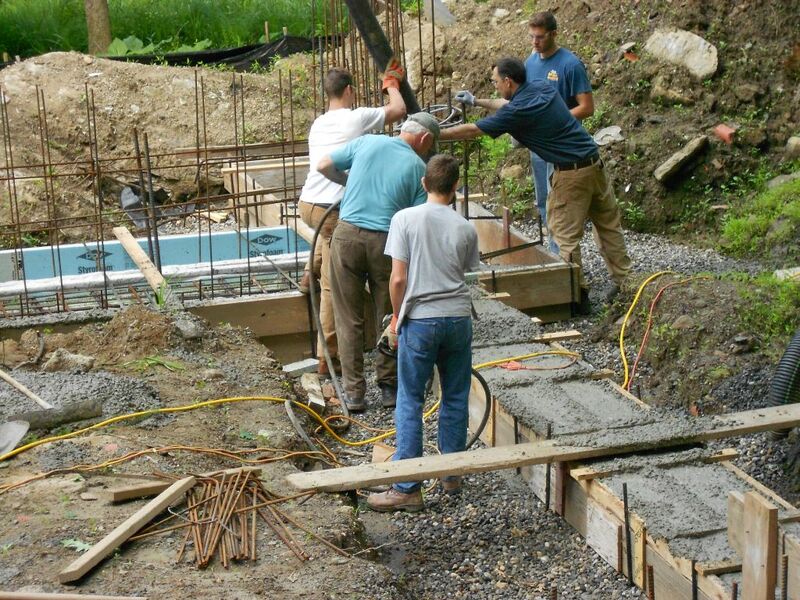 Of Wall Forms and the Hobbit Hollow Crew.